What is collaborative piano? Singers are well aware of the need for accompanists, but as a pianist, did you know there’s an entire field of study dedicated to the art of accompanying? What kind of a degree does a collaborative pianist hold? And what are the career options? We spoke with some professionals in the field to help answer these questions. Here are a few important thoughts to guide you as you explore collaborative piano. 1. What is the difference between solo piano performance and collaborative piano? A solo pianist performs as a soloist—either completely alone, or as the “main event” in front of an ensemble such as an orchestra. A collaborative pianist, on the other hand, focuses on collaborating and partnering with other artists. He or she is a talented performer in their own right, who enjoys working with soloists and chamber musicians as the primary means of performance. 2. What does one study in a collaborative piano program? Some students also choose to take classes in opera, baroque ensemble, or orchestral piano. In this way, they are both expanding their knowledge of repertoire and performance practice while working with a wide community of musicians. At Carnegie Mellon University School of Music, Mark Carver and Luz Manriquez run a program that crosstrains students to be fluid in both instrumental and vocal collaboration. “The students study chamber music and lyric diction, and work with instrumental and voice faculty in the studio. The graduate collaborative recital culminates in the presentation of both instrumental and vocal repertoire,” says Carver, associate teaching professor in Collaborative Arts. A collaborative pianist can therefore train to focus more exclusively on working with vocalists, instrumentalists, or both, depending on the institution they choose. 3. Undergraduate, graduate, or both? The undergraduate vs. graduate question might seem like a tough one, but a philosophy shared by every school of music — including those offering an undergraduate degree — is that the development of strong piano skills at the undergraduate level is paramount. In both of the undergraduate collaborative programs mentioned above, there is still a strong focus on solid technical and musical skills, but with some additional courses such as diction, ensemble performance, and vocal coaching. Several of the professionals interviewed for this article agree that to gain ideal marketability, graduate study in collaborative piano should be part of your plan no matter what you pursue as an undergraduate. Additionally, a DMA (Doctor of Musical Arts) may be necessary for careers in academia. 4. With what background does one typically come into a collaborative piano program? Though strong piano skills are an absolute must, backgrounds can be quite varied. According to Barbara González-Palmer, professor of Collaborative Piano at Rutgers University’s Mason Gross School of the Arts, most students come from a degree in piano performance. Some of these students accumulated experience by doing some accompanying during their undergraduate degree and developed an affinity for it. Sabine Krantz, freelance accompanist in Central New York, came to collaborative piano in a different way. “I was a church musician from age 12. I had to follow the congregation whether I was playing the right notes or not. It taught me to listen, always to be with the beat, and to sight read.” Dr. Slingland concurs that sacred music is another common background that draws in collaborative pianists, and that there is not just one path to the profession. 5. What are the hallmarks of a successful collaborative pianist? Timothy Hester, professor of Piano and director of Keyboard Collaborative Arts at the University of Houston’s Moores School of Music, says the most successful students “tend to be people who possess a willing attitude to step in and ‘go for it.’” Students who enjoy working with others, but don’t necessarily need to be directly in the limelight to feel successful, are ideal. Dr. Tim Burns, supervisor of Collaborative Piano at Colorado State University, adds that flexibility, grace under pressure, and deep observational and listening skills are essential qualities for a successful collaborative pianist. 6. What are career options for students who graduate from Collaborative Piano programs? According to Barbara González-Palmer, there are many career paths for collaborative pianists to pursue. While in school, pianists can work by accompanying students for lessons, competitions, and other performances. Timothy Hester adds professional chamber musician, choral accompanist, and operatic accompanist to the list of options. Due to the breadth of training in collaborative piano programs, students could also qualify for work in summer festivals and even potentially as studio musicians. 7. What kind of support and training outside of the required courses can one expect to find? This varies from school to school. At Appalachian State, students are assigned a wide variety of collaborative work (opera rehearsals, voice lessons, instrument lessons, orchestra) as part of their assistantships to broaden their experience and make them more marketable. The Moores School is in urban Houston, and Professor Hester says that with a city so fertile in the arts, there are lots of opportunities –– from creating performing groups off campus, to playing for University Interscholastic League competitions in the public school system. 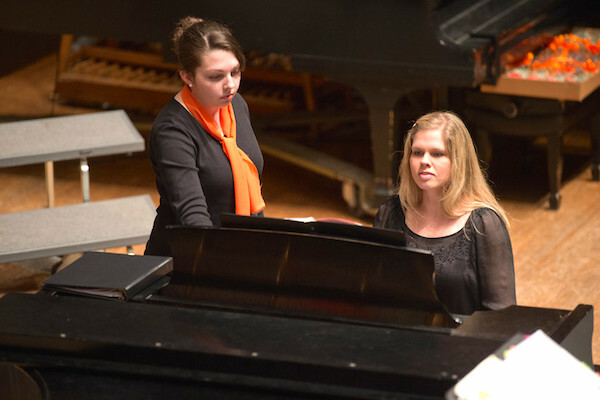 At both the Moores School and at Mason Gross, some students gain experience as paid staff accompanists at the college level. Beyond required classes, support and training vary from school to school. At Appalachian State, students are assigned a wide variety of collaborative work (opera rehearsals, voice lessons, instrument lessons, orchestra) as part of their assistantships to broaden their experience and make them more marketable. Knowledge of languages – French, German, English, and Italian are the four main languages that vocalists study in both their lessons and in diction courses. These languages are therefore very useful for collaborative pianists to understand. Career options in this field continue to evolve. Note that many of the positions listed here are freelance.